This Saturday is Record Store Day, the international celebration of independent music stores. And we’ve got a Featured Release! 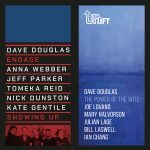 You can grab a special edition 7″ from Dave Douglas, Showing Up, which features tracks from our recent subscribers series, ENGAGE and UPLIFT.